Get a Roast Beef Po'Boy at the Lunch Box in Waveland. A sound piece advice for anyone traveling the Mississippi West Coast - skip fancier places for a good old-fashioned lunch room and one of the best po'boy sandwiches I've ever had in my life. 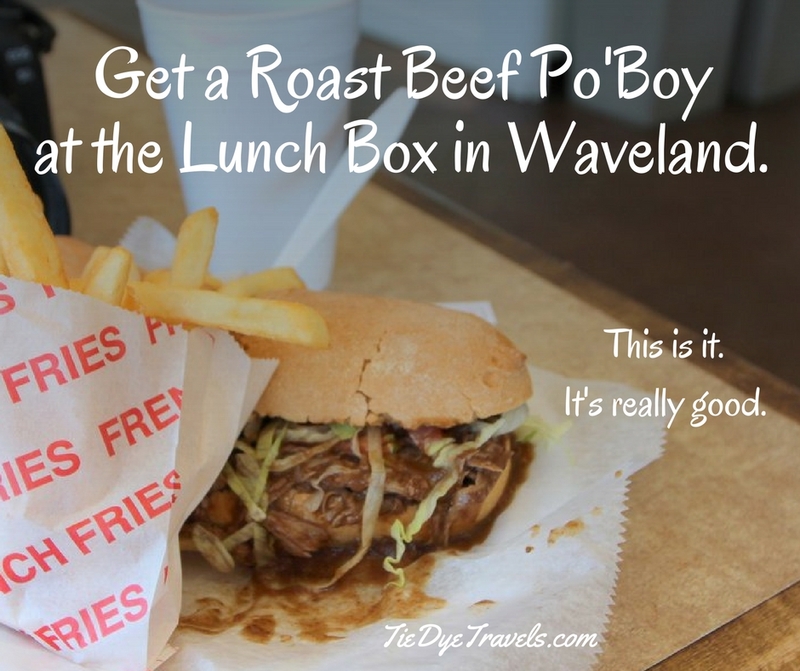 It's time to go try the Lunch Box in Waveland. Grav and I were out playing Pokemon Go (I kid you not - we were chillin' out and conquering gyms, because hey, sitting in cars playing Pokemon with boys is romantic as heck) and finding ourselves developing a hunger during our vacation in coastal Mississippi (where we weren't supposed to be writing about or researching anything, LOL) so we went in search of po'boys. 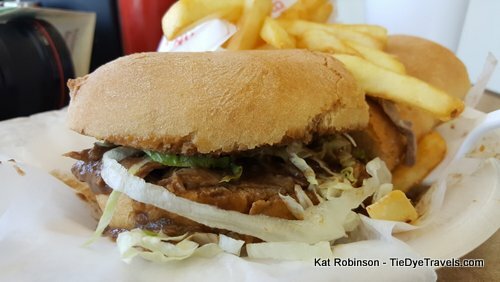 We already knew we were going to be taking home seafood po'boys from Claiborne Hills Supermarket, but there was a craving both of us wanting to satisfy this particular Monday. We'd already had two misses, showing up at restaurants that were reportedly open according to their websites, but closed on Monday as so many restaurants are wont to do these days. So even finding the Lunch Box open was a thrill. 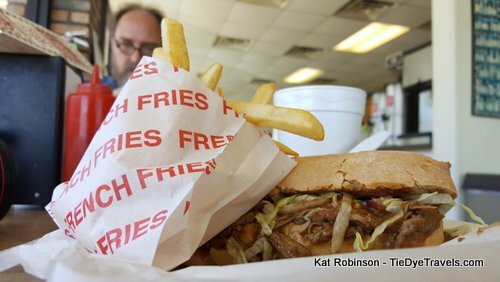 We went in and then argued for several minutes over whom would get the roast beef po'boy and who'd get something else to shoot - because when we intend to write about a restaurant, we always try multiple dishes. I cannot quite convey to you how good this restaurant smelled. It had the heavy, savory and rich aroma of beef gravy just hanging in the air, like an elephant in a conversation you cannot avoid, but in a good way. I noted the Barq's Root Beer in a bottle mentioned multiple places while Grav dithered, then decided screw it, we were on vacation, he'd get what he wanted. Which was sort of my thought from the get-go. We were handed a numbered slip, filled our cups with iced tea from a dispenser and sat at a table, half-heartedly reading through a brochure on the area but more flirting and lazing about. We were on vacation, right? 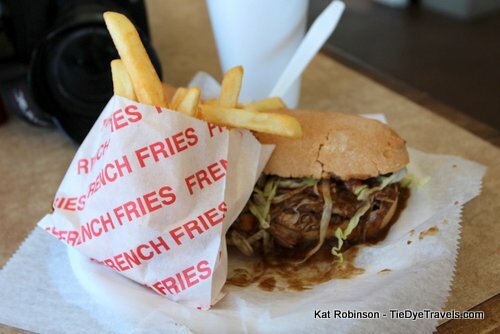 Still, those po'boys were being called from the counter, the numbers were being counted up, a couple were delivered by hand to regulars who had undoubtedly seen the place for some time. 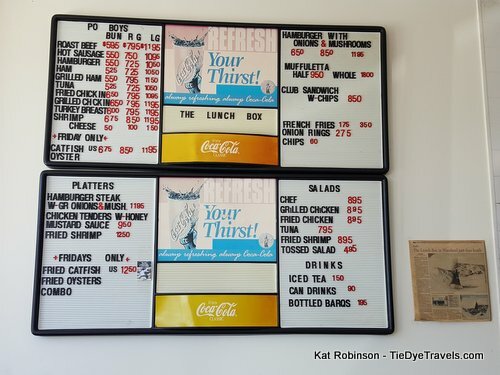 There were a few yellowed articles on the wall, including one with the least interesting title ever - "The Lunch Box in Waveland just does lunch" - and windows along two walls. And we were so relaxed. Our number was called and Grav grabbed the two plates, plopping the one with our shared order of fries on my side. We looked at each other, took a few photos and just dug in. I think both of us tried to pick those sandwiches up with our bare hands, but that didn't last long. Hooray for forks. The crispy fries also went well in the thick debris-filled gravy that swamped the loaves, which quickly disintegrated on our plates. Indeed, while our first bites were taken from sandwiches held with quickly-wet napkins between trembling fingers, followed by bites carefully pressed cut by the side of plastic forks, at the end it was simply a matter of scooping up the remaining gelatinous-bready-meaty mass with those same forks, every bit savored. 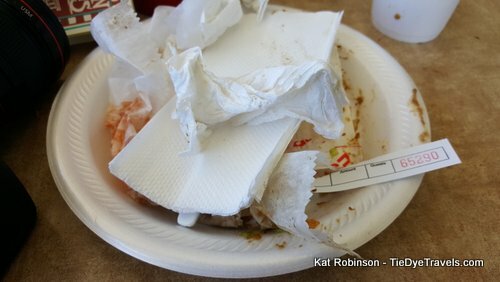 The determination I made not to lick the plate came from the prodigious mound of napkins I'd managed to build in the attempt to prevent my shirt from bearing later witness to the act of gluttony I had just committed. There was never any talk of ordering one to go. It would not have survived the drive to our AirBNB, much less to Little Rock, without the benefit of tight fitting plastic storageware. And yet we were full and happy, and spent the rest of our afternoon driving the length of US 90 from there to Biloxi and back. Later I'd look at the Lunch Box's Facebook page and wonder why we chose nothing else that day - but then that heavy scent of debris-packed gravy returned to the front of my mind, and I knew damned well why.